Current interior design tendencies confirm that natural wood especially oak turns into an element of elegance, subtlety, organic contrast to industrial, artificial materials. Let‘s review some of the recent projects, which were designed with oak flooring and create an impression of cosines, subtle harmony and moderate luxury. 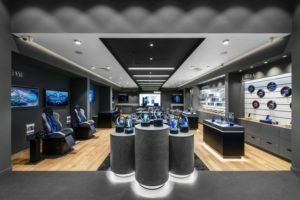 The interior, with thousands of people visiting, has specific requirements: from brand-to-product communication to cozy comfort, so that customers can analyze, interest, and ultimately decide to buy a new phone or equipment in a comfortable and engaging environment. The “Design Mat” team successfully solved the challenge by creating an intensive screen – blue and gray dynamic that is fragmented by the details of black furniture and other equipment. 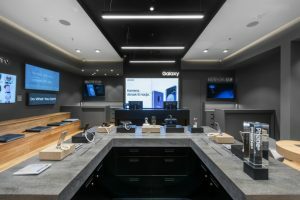 The futuristic first impression is outweighed by the light oak flooring, which has a directional orientation as a way forward, leading from the entrance to the showroom, where visitors are welcomed by staff, where a conversation about what’s most important – Samsung’s mobile equipment. The showroom accentuates the experience of the customer (Experience store), and the best experience takes place in a safe environment. It is created by the warm color of a natural tree that emits cosiness in bright shades, invites customers to stay, to keep the focus on the most important task – to experience what the best is offered by Samsung. Additional wooden details – cozy seats to sit or light colors as well as wooden furniture – enhance the visual contrast between technology and wood. The man becomes a connecting link, and has gone through new experiences warmed by oak coziness. 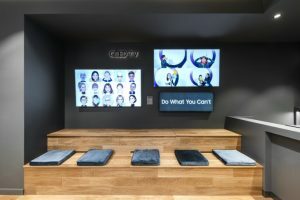 [Samsung Experience store, Vilnius, Akropolis, „Dizaino matas“, foto L. Garbačiauskas]. The natural need of man to approach nature is increasingly manifested by connecting images to the window, creating windows as wide as possible and combining with the natural wood used in the home interior. Designed for a young family, all the details of the functional, exhausted space, and the view of the forest behind the window are opened at every step. Combined with swaying trees, smart oak flooring is a natural extension of the home. Subtle undercoat retains natural wood holes, wavy twigs, natural wood shades accentuate the light color of the interior, reminiscent of the forest behind the window, the same brown moss, and the softness of the feet, as if the inhabitants of the house were going through a soft forest floor.